IT WAS ON MAY 4, 1949, that 31 people lost their lives when the flight carrying the players and management of Torino Football Club home from Lisbon crashed into the Superga hillside amidst thick fog. Among their number was the architect of the squad, a man who had filled the roles of coach and technical director over the previous decade. In English football parlance, he was the manager. During his time at the club, he had introduced modern training techniques, pioneered tactical innovations that were decades ahead of their time and proved that the football manager could be more than just a coach; that he could be warm, approachable and interested in his players’ well-being off the pitch. He scouted the best talents available, encouraged his president to sign them on generous contracts and inspired those gifted individuals to become even better, together. His side became a symbol of Italian resurgence after the Second World War, forming the backbone of a strong national team and dominating domestic football in Italy until the day they died, together. 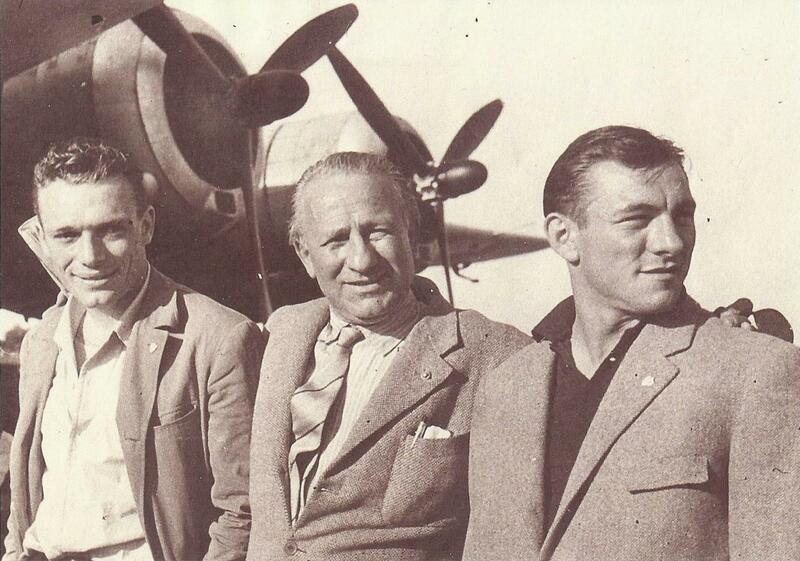 He was Ernő Egri Erbstein (pictured centre), his team became known as the Grande Torino and in the immediate aftermath of the crash, the team who had not lost a home match for over six years were posthumously awarded their fifth consecutive scudetto. The Grande Torino, who were returning from a friendly game against Benfica in Lisbon when the wing of their plane clipped the embankment wall of the basilica atop Superga, dominated Italian football in the 1940s. Leaving their wealthy neighbours Juventus in the shade, the team put together by Egri Erbstein and club president Ferruccio Novo lifted the spirits of the working class, both in Turin and all over Italy. They also revolutionised the way the game could be played by fusing the short Central European passing game with Italian flair and the solidity of the English W-M system. Indeed, the formation pioneered by Herbert Chapman’s Huddersfield and Arsenal sides in pre-war England was the basis for Erbstein’s preferred tactic in Turin, where it became known as il sistema. “Egri Erbstein’s Torino had already put into practice – in the forties – tactical concepts that have only been fully assimilated in recent years,” assessed Amedeo Amadei, who became a regular in the Italy squad alongside the Grande Torino players. Such was their dominance of the domestic game that, on one occasion, Torino provided ten of the starting XI for an Italy international game against Hungary. Symbolically, it was former Italy coach Vittorio Pozzo who took on the responsibility of identifying the bodies of the Torino players and management following the crash. At the funeral service for the team, which was preceded by a solemn parade attended by more than half a million people, the head of the Italian Football Association, Ottorino Barassi, stood to pay tribute to the fallen, addressing the coffins as if the bodies inside could hear his words. Tearfully, he officially declared them champions for 1948-49. That evening, each coffin was placed on the back of a flatbed truck, surrounded by flowers, and the funeral procession, led by the youth teams of Torino and Juventus, dressed in full match kit, made its way to an official memorial ceremony at the Duomo. This was the first chance for many in the crowd to see the pale maplewood caskets of their heroes. They mourned the thirty-one: the pilots Pierluigi Meroni and Cesare Biancardi; the flight crew members Antonio Pangrazi and Celeste D’Inca; the tour organiser Andrea Bonaiuti; the journalists Renato Casalbore, Renato Tosatti and Luigi Cavallero; the club directors Rinaldo Agnisetta and Ippolito Civalleri; the masseur Ottavio Cortina; the first-team coach Leslie Lievesley; the Grande Torino squad: Valerio Bacigalupo, Aldo Ballarin, Dino Ballarin, Emile Bongiorni, Eusebio Castigliano, Rubens Fadini, Guglielmo Gabetto, Ruggero Grava, Giuseppe Grezar, Ezio Loik, Virgilio Maroso, Danilo Martelli, Valentino Mazzola, Romeo Menti, Piero Operto, Franco Ossola, Mario Rigamonti and Giulio Schubert; and their manager Ernő Egri Erbstein. The manager’s coffin was identifiable because the green, white and red stripes on the flag draped over it were not vertical like those on the Italian flag, but horizontal – the colours of Hungary. The timing of the Superga disaster – with four league fixtures still remaining – ensured that Egri Erbstein never completed a full season at the helm of Torino. He had spent a large chunk of the 1947/48 season scouting for players in Eastern Europe and checking in on the running of feeder clubs, while the he had only returned to Turin a couple of months into the 1946/47 campaign following his traumatic experience in Budapest during World War II. The introduction of Benito Mussolini’s anti-Semitic Manifesto of Race had forced Erbstein – who was Jewish – to flee Italy midway through his first season as Torino manager, in December 1938, but an incredible sequence of events prevented him from becoming another victim of the Holocaust. Everyone who came across Egri Erbstein was deeply affected by their encounters with him, and, in an era when the term ‘cult of personality’ carried sinister connotations, he wielded his strong character to positive ends. As the dark days of the Budapest Holocaust threatened to end in tragedy for many of the Hungarian capital’s interned Jews, he led a breakout from his labour camp and set the wheels in motion for the unlikely escape of his wife and daughters from a workhouse just as it was set to be ransacked by fascist forces. Adversity was no barrier to him and overcoming it became a habit, but despite those traumatic wartime experiences, his passion for football never left him. With that in mind, perhaps his greatest achievement was becoming one of Europe’s most sought-after and respected coaches at a time when survival was a remarkable feat in itself. As many in the know have suggested, the legend of the Grande Torino would not have been quite so “grande” without his influence. With thanks to Dominic Bliss for providing this story. For more, check out the outstanding ‘Erbstein: The triumph and tragedy of football’s forgotten pioneer’ from Blizzard Books. Visit theblizzard.co.uk/product/erbstein-the-triumph-and-tragedy/ to order your copy.